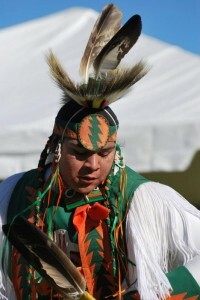 CSUN student Johnny Nieto, at last year’s powwow. Photo courtesy of Scott Andrews. American Indian singers, drummers and dancers will gather at California State University, Northridge for the 30th Annual CSUN powwow on Saturday Nov. 30. The event, which is open to the public, starts at 10 a.m. and ends at 9 p.m. It will include a variety of arts and crafts booths, along with a children’s activity table. The CSUN Powwow’s Grand Entry is scheduled for 12:30 p.m. That is when all of the dancers enter the arena together, led by elder dancers, an eagle-feather staff and the U.S. flag. 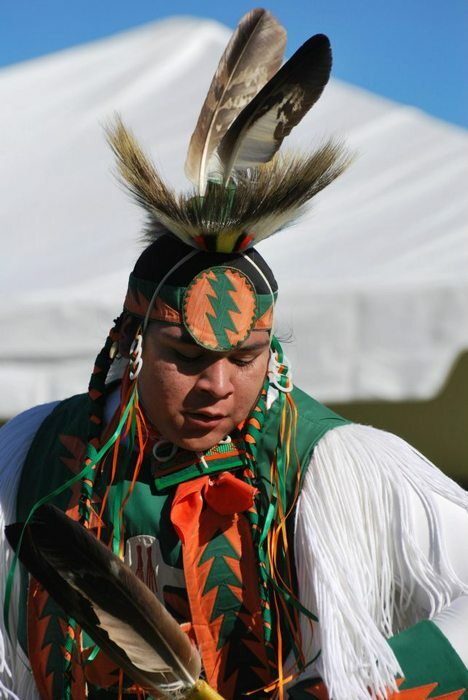 The powwow will be held on the north side of the CSUN campus on the Chicano House lawn; visitors should enter campus on Plummer Street from Reseda Boulevard. Signs will direct visitors to the event. Los Angeles County has about 200,000 —American Indian residents, according to the last federal census, and about 70 percent of them live in urban centers. The CSUN powwow started in the 1970s. Although there was a span of years in the late 1990s to early 2000s when there was no powwow, the students revived it in 2003. CSUN alumna Debbie Martinez Rambeau helped organize the first such events at CSUN and will be honored this year as Head Woman. As Head Woman, she will be the leader of the female dancers during the day’s events. The event is sponsored by the Associated Students of CSUN, the American Indian Student Association, the American Indian Studies Program and the West Coast American Indian Music Awards. For more information, call (818) 677-5030 or send an email to aisacsun@yahoo.com.